There has been a lot of hype lately on a somewhat new photographer who specializes in ocean and beach photography. He goes by the name Clark Little, and his photographs are something to talk about. In fact, you may have seen him recently on Good Morning America where he talked about his love and passion for ocean photography. Clark Little began his wave and beach photography in 2007 when his wife told him that she wanted a photo of a wave in their house. He offered to take the photo himself since he had been surfing for 35 years and understood the dynamics of a wave. He has since upgraded to a professional camera and has had his photos featured on the Today Show, ABC World News Now, Paris Match (France), Hana Hou (Hawaiian Airlines) magazine, Surfer magazine and other publications in both the U.S. and overseas. 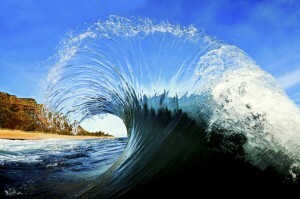 Clark Little takes a unique approach to beach photography, and strives to capture shots from inside the barrel. This style requires a lot of practice and plenty of waves slamming him to the sand. “I hold the trigger then just hold my breath,” Little says when talking about how he captures such incredible shots. His photographs are original and exciting and have definitely inspired other photographers who specialize in beach photography. 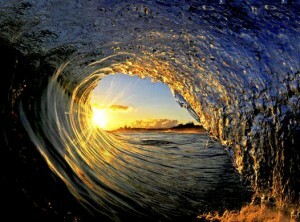 To see more beach and ocean photography done by Clark Little, visit his website at: www.clarklittlephotography.com. 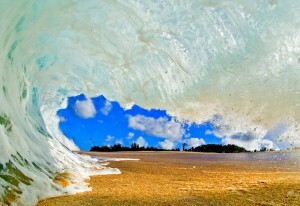 Clark Little has several of his prints for sale on his website which I encourage you to take a good look at. You won’t find anything like it anywhere else.